The culmination of a four-year collaborative research project undertaken by leading UK universities, in partnership with city authorities, prominent architecture firms, and major international consultants, Retrofitting Cities for Tomorrow's World explores the theoretical and practical aspects of the transition towards sustainability in the built environment that will occur in the years ahead. The emphasis throughout is on emerging systems innovations and bold new ways of imagining and re-imagining urban retrofitting, set within the context of ‘futures-based’ thinking. The concept of urban retrofitting has gained prominence within both the research and policy arenas in recent years. While cities are often viewed as a source of environmental stress and resource depletion they are also hubs of learning and innovation offering enormous potential for scaling up technological responses. But city-level action will require a major shift in thinking and a scaling up of positive responses to climate change and the associated threats of environmental and social degradation. Clearly the time has come for a more coordinated, planned, and strategic approach that will allow cities to transition to a sustainable future. This book summarizes many of the best new ideas currently in play on how to achieve those goals. 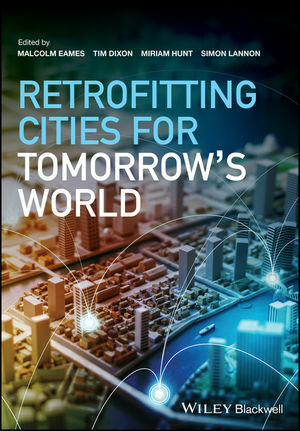 Retrofitting Cities for Tomorrow's World is must-reading for academic researchers, including postgraduates insustainability, urban planning, environmental studies, economics, among other fields. It is also an important source of fresh ideas and inspiration for town planners, developers, policy advisors, and consultants working within the field of sustainability, energy, and the urban environment. Malcolm Eames, PhD until recently held a professorial chair in Low Carbon Research with the Low Carbon Research Institute at the Welsh School of Architecture, Cardiff University, UK, and was the Principal Investigator for the EPSRC Retrofit 2050 project. Tim Dixon, PhD holds a professorial chair in Sustainable Futures in the Built Environment in the School of the Built Environment at the University of Reading and leads the Sustainability in the Built Environment (SustBE) network. Miriam Hunt is a PhD student at School of Social Sciences, Cardiff University, UK. Simon Lannon, PhD is a research fellow at the Welsh School of Architecture, Cardiff University, UK.